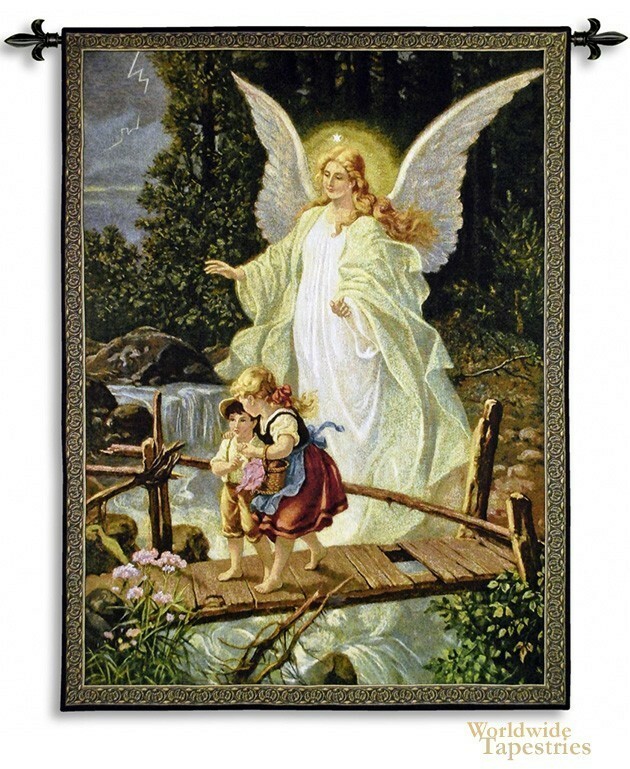 This tapestry "Guiding Angel" shows the guardian angel protecting children on the bridge over troubled waters by Lindberg. Also known as "Heilige Schutzengel" or holy guardian angels, this angel is seen in a bright luminous glow holding her protective hands over the children as they cross the bridge. This work captures the hallmarks of Lindberg's works depicting angels, with their fantasy like rendition of scenes, rich use of color and detailed composition. These works by Lindberg has become icons in themselves in Christian and religious tapestries. This tapestry "Guiding Angel" is backed with a lining and has a tunnel for easy hanging. Note: tapestry rods and tassels, where pictured, are not included in the price.